Sometimes you need a stash busting, quick project! The Sia Scarf is just that! It’s fast and uses just one skein of yarn! I’m sure you have enough in your stash, or you can get creative with multiple colors! I designed the Sia Scarf to be a fun pattern repeat that won’t be boring! This scarf is perfect for when the weather is just getting chilly or just starting to warm up! 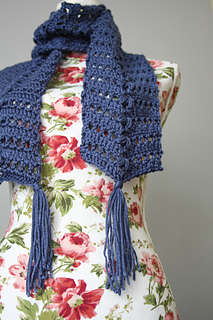 Light and lacy, you’ll love this scarf and so will everyone else! So be ready to make multiples! 256 yards #4 Worsted Wt.